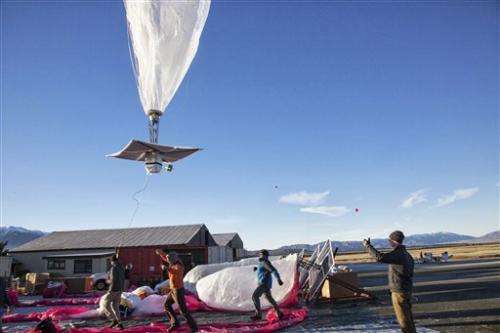 Google is launching Internet-beaming antennas into the stratosphere aboard giant, jellyfish-shaped balloons with the lofty goal of getting the entire planet online. Eighteen months in the works, the top-secret project was announced Saturday in New Zealand, where up to 50 volunteer households are already beginning to receive the Internet briefly on their home computers via translucent helium balloons that sail by on the wind 12 miles above Earth. If successful, the technology might allow countries to leapfrog the expense of installing fiber-optic cable, dramatically increasing Internet usage in places such as Africa and Southeast Asia. Nimmo is among the many rural folk, even in developed countries, who can't get broadband access. After ditching his dial-up four years ago in favor of satellite Internet service, he has gotten stuck with bills that sometimes exceed $1,000 a month. In recent years, military and aeronautical researchers have used tethered balloons to beam Internet signals back to bases on Earth. Google's balloons would be untethered and out of sight, strung out in a line around the globe. They would ride the winds around the world while Google ground controllers adjusted their altitude to keep them moving along the desired route. In the U.S., however, Google would have to notify the Federal Aviation Administration when the balloons are on their way up or down. The company is talking with regulators in other countries about meeting their requirements. Google chose New Zealand in part because of its remoteness. Some Christchurch residents were cut off from the Internet for weeks after a 2011 earthquake that killed 185 people. 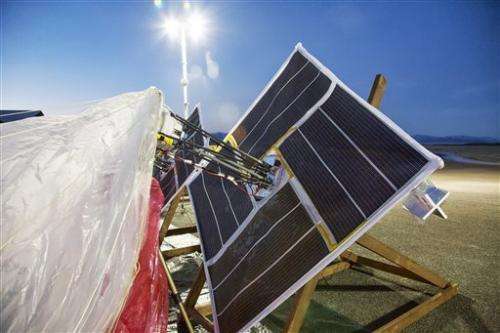 Google said balloon access could help places suffering natural disasters get back online quickly. "The potential of a system that can restore connectivity within hours of a crisis hitting is tremendously exciting," said Imogen Wall at the U.N. Office for the Coordination of Humanitarian Affairs, although she warned that the service must be robust. "If the service fails in a crisis, then lives are lost." Temple University communications professor Patrick Murphy warned of mixed consequences, pointing to China and Brazil as places where Internet service promoted democratic principles but also contributed to a surge in consumerism that has resulted in environmental and health problems. Already the world's largest advertising network, Google stands to expand its own empire by bringing the Internet to more corners of the Earth. More users means more potential Google searchers, which in turn translates into more chances for the company to display ads. Richard Bennett, a fellow with the nonprofit Information Technology and Innovation Foundation, was skeptical of the project, noting that smartphones are increasingly being used in developing countries. Before heading to New Zealand, Google spent a few months secretly launching two to five flights a week in California's Central Valley. "People were calling in reports about UFOs," DeVaul said. I could invasion this being a replacement for expensive infrastructure that gives us far cheaper internet one day. Good idea google.